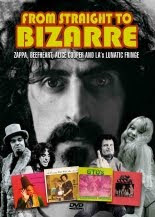 This is an interesting documentary release – From Straight to Bizarre: Zappa, Beefheart, Alice Cooper and LA’s Lunatic Fringe. It comes from Chrome Dreams who you may remember from the Captain Beefheart: Under Review DVD. The dvd documents Zappa’s attempt to control his recordings by setting up his own labels, Straight and Bizarre – while at the same time releasing music from LA’s freak scene which would otherwise have never made it to vinyl. Although it mentions all the albums released it concentrates on those by Alice Cooper, The GTOs, Wild Man Fischer, Jeff Simmons and, of course, our man Captain Beefheart. So for Beefheart fans there is quite a bit of interest here especially the new interviews with John French and Bill Harkleroad talking about working on Trout Mask Replica and Lick My Decals Off Baby. There are also interviews with a number of music writers, Ben Watson, Mark Paytress, Billy James, Ritchie Unterberger and Barry Miles, as well as with Miss Pamela and Miss Mercy of The GTOs, Denis Dunaway and Neal Smith of Alice Cooper, Jerry Lawson of The Persuasions, Essra Mohawk, Jeff Simmons and Kim Fowley. All the interviews are interspersed with archive footage (good quality stuff too) and samples of the music. At just over two and a half hours this is a fascinating and entertaining documentary. A bit of a pain in the wotsit. It’s been a long time since I’ve been immersed in this much anticipation as regards a music release. I’m sure a few more weeks won’t kill me all the same.